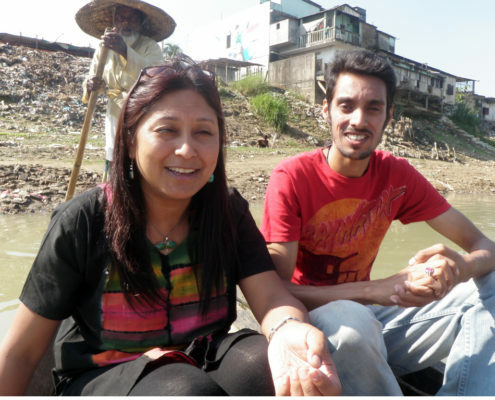 Shutki Love, and A Journey into Bangladesh and India’s Northeast. 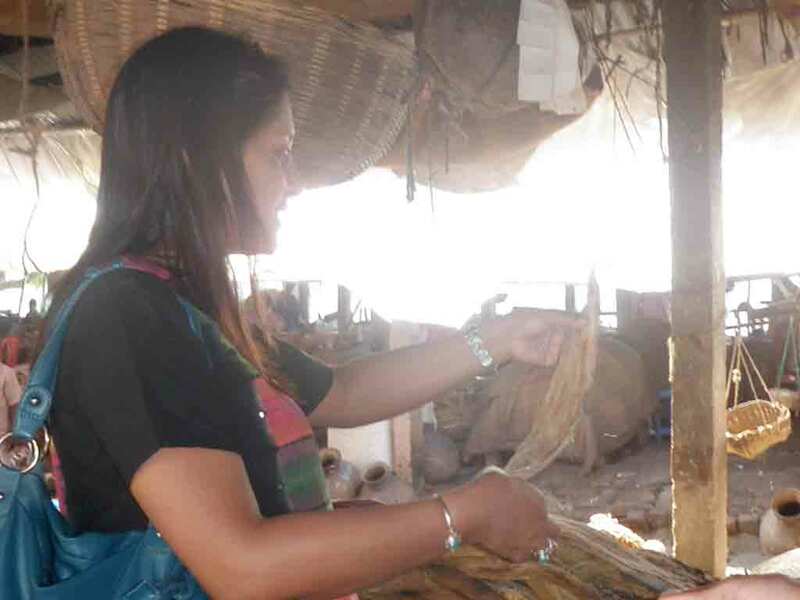 I have loved eating dry fish delicacies ever since I was a little girl. In the company of my Khasi mother from Laitsohum, East Khasi Hills in Meghalaya, and my late father from Sylhet in Bangladesh, growing up has been about enjoying fermented fish. Known as Shutki in Bengali, dry fish – whether it is the Khasi Tungtap or the Bengali Sidol – has always coloured my childhood memories. 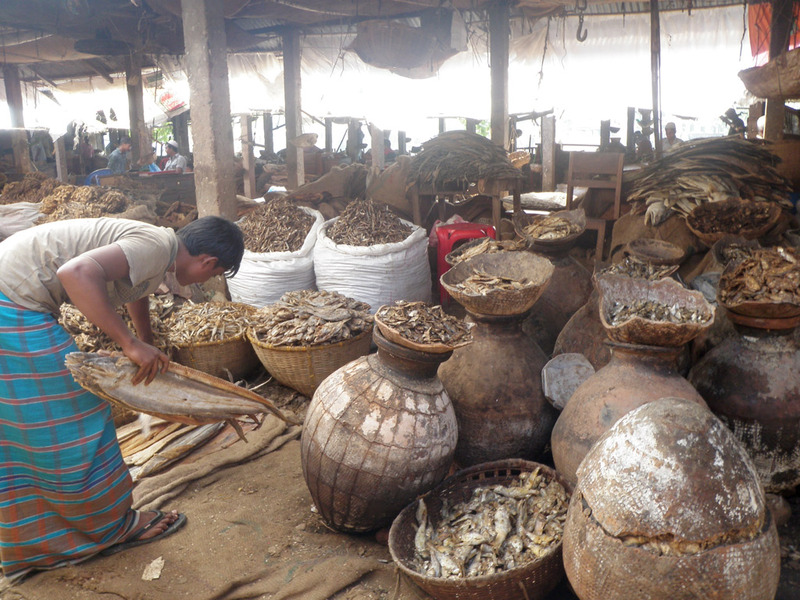 Dry fish, has, in fact, been an ancestral delicacy in most tribal communities of Northeast India. Its popularity is now growing stronger and wider. I also learnt to enjoy cooking since an early age. I recall going with my late father to shop in the haats (rural markets) of Balat, a small town in Meghalaya bordering Bangladesh, where our winter holidays were spent. 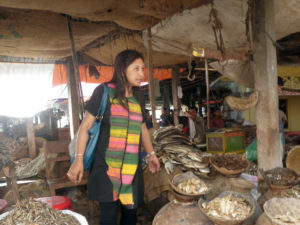 As a young schoolgirl, I witnessed the fish trading between Meghalaya and Bangladesh in that haat. Most of the raw and dry fishes came from Bangladesh. My parents would always insist that the fish cooked in the house must be bought from the local border market. It was such a ritual that even our close family friends would get their fish, through our family, especially if they were looking for a special type of fish. As I began my journey into development and entrepreneurship, I saw the decline of this fish industry. And soon enough, we were eating fish coming from Andhra Pradesh. 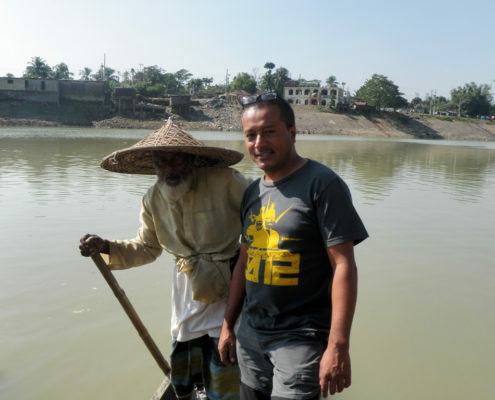 In November 2012, on an official trip to Bangladesh, I decided to travel by road from Shillong to Dhaka via Sylhet from the Indo-Tamabil border with my friend Vikash Pradhan. On the way back, we stopped by Sylhet to visit my uncles and cousins. 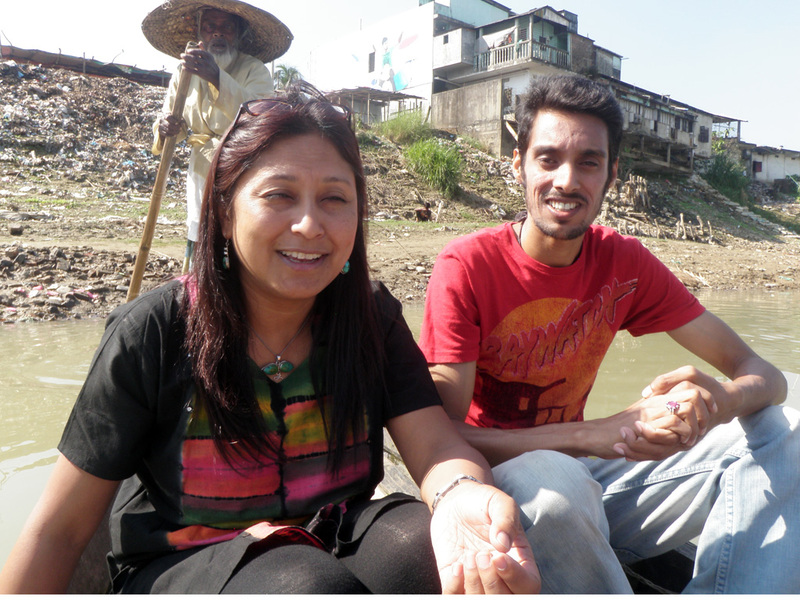 My mother and sister had insisted that I stop by the dry fish market in Sylhet by the side of the River Surma. I travelled by boat to fetch my prized dry fish and was amazed to discover dry fish exports going to the UK, the USA, Canada and the Asian markets. That is when I remembered how my late grandmother (who was living in the UK) fed me my favourite Sidol chutney a few years ago when I had visited her on an official trip. I had called her before the visit and she promised to have it ready. I knew it wouldn’t be available in the UK but she managed to procure it somehow. On asking, she mentioned that it comes from Sylhet. It was a pleasant surprise. 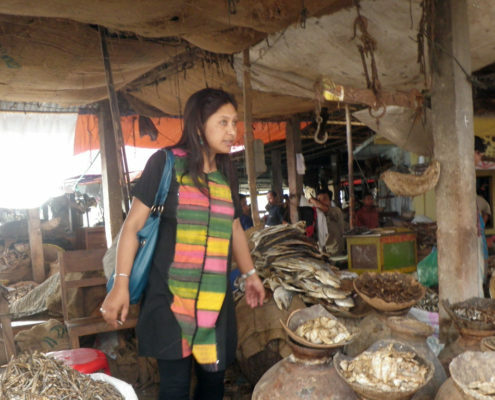 Last year in November (2012), I decided to visit the dry fish market to understand the economics behind it. 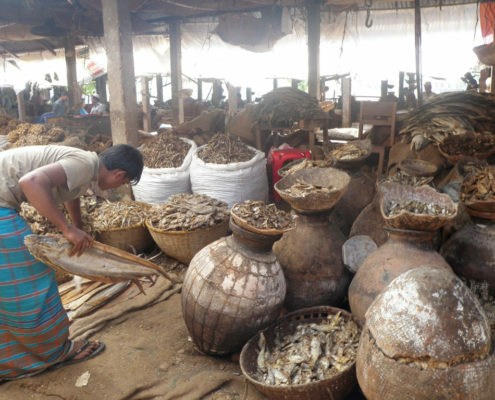 My study revealed that the existence of the dry fish business is under threat due to various reasons. While the business has secured a strong position in the global economy, the supply to local markets has declined since the last decade. Yet, the government hasn’t paid enough attention to the sector. Most industry insiders believe that the market for dried fish started shrinking two decades ago when the government clamped down fish import through illegal ways in the 1990s, without easing the legal ways of importing it. Traders, I had interacted with, told me that the demand for local dried fish is growing higher in domestic and foreign markets, but due to a shortage of production in Bangladesh and because the cost of importing dry fish is higher than fresh fish, most traders now like to import fish from India and Myanmar and then dry those. Some fishermen also catch mother fishes during May and June (the fish-breeding season) taking advantage of the lack of surveillance. Of course, the Indian government has now deployed coast guards in their territory, to keep a check on it, which the fishermen have duly started respecting. Apart from the imports, local fishermen also face another big problem; that of succumbing to the monopoly of bigger players. catch is dried round the year, with substantial production during October to April. It is then marketed in both domestic and international markets. Yet, the local producers have no influence over marketing and supply chain management. It is the giant traders, brokers and supermarket companies, which regulate and monopolise the system, leading to price distortion in the domestic market, thereby eroding the profitability and preference of primary producers. The reason why Bangladesh is facing poor entrepreneurship development is therefore, the bullock-cart-pace of effective value chain linkages among the farmers, traders, processors and business service providers. I believe that for this trade to boom, small-scale producers need to be integrated with domestic as well as international markets, especially with border trade and border haats, which are operating in Meghalaya and Assam. This is especially true for the high-valued, perishable commodities. While development of profitable technology plays an important role in promoting entrepreneurship, value addition to the micro-level production initiatives is equally a priority issue. The government has provided agro-entrepreneurship development, with various incentives including tax exemption, import duty concession, special budgetary allocation and export promotion. 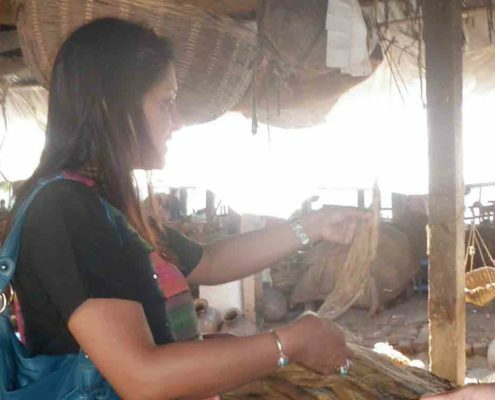 But it still remains necessary to examine how the policy issues support the marketing of dried fish in both domestic and international markets, and what additional policy support is needed to make this sector sustainable.